Following in Hofmann’s footsteps, James Gahagan was an accomplished painter as well as a beloved teacher and mentor to others. Inspired by nature, his sensitivity to color relationships and spatial dynamics made him one of the most skillful American colorists. Born in Brooklyn in 1927, Gahagan claimed that his serious interest in art did not manifest until he was in high school, though some of his earliest memories included selling large scale, hand-drawn renditions of Disney characters to his family members for twenty-five cents. Gahagan was one of the many artists in the late 1940s that were able to pursue their studies thanks to the G.I Bill. After serving in the Navy during World War II, he attended Goddard College in Plainfield, Vermont (1947-51) where he studied with two former Hofmann students. He soon moved to New York, where he himself began attending the Hans Hofmann School of Art and became involved with the then-burgeoning abstract movement. His visual vocabulary developed during his years as Associate Director of the Hofmann School and as Hofmann’s assistant during the creation of two major mosaic murals in New York City. 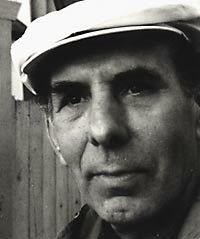 Gahagan taught painting at Pratt Institute (1965-1971), Columbia University Graduate School of the Arts (1968-1971), and Goddard College (1971-1979), where he became Chairman of the Art Department. He opened the James Gahagan School of Fine Arts in Woodbury, Vermont during the summers of 1971-1974 and was invited to be a visiting artist at Notre Dame University (1978) and at Humboldt State University in California (1989). He was invited to teach at the founding of the prestigious Vermont Studio Center (1984-1999) and in 1991-92 became the resident Artist/Critic at the International Art Workshop in New Zealand. He has exhibited his work extensively in New York and Provincetown, and has also periodically shown in San Francisco, Los Angeles and Paris. His work is represented in the public collections of the Metropolitan Museum of Art, New York; The Chrysler Museum in Norfolk, Virginia; and the University Art Museum in Berkeley, among others. He died at his home in Woodbury, Vermont in 1999 at the age of 71.